To mark Samoan Language week, we are featuring a great Samoan resource in our heritage collections whose existence was alerted to me by a sleuth-like colleague. We have a carbon copy typescript of the Samoa guardian from 26 May 1927 to 6 June 1929. Though this transcript finishes in June it provides a particularly valuable historical record of the two years leading up to the disastrous events of Black Saturday. Ref: Auckland Weekly News, Reinforcement for the Administration Police at Samoa, 26 April 1928, Sir George Grey Special Collections, Auckland Libraries, AWNS-19280426-38-3. 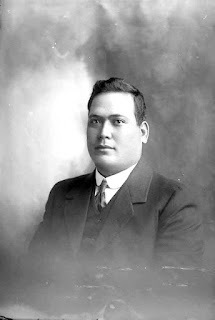 The Samoa guardian came into Auckland Libraries collection through a donation from the estate of the Rev. Albert Bygrave Chappell on 25 January 1951 along with some of his other papers which are now part of our Manuscripts collection. The mystery in the provenance is how this ended up in the possession of Rev. Chappell in the first place and why did he have a carbon copy typescript? It is also curious to note that this came into the library’s possession in 1951, but Rev. Chappell passed away in 1942. This article about the Post Office destroying copies of the Samoa guardian could indicate that physical copies of the paper were hard to come by so perhaps a typescript was the only available format. Although the Samoa guardian was published in English, it is still an important resource as it was essentially the voice of the opposition to New Zealand rule in Samoa. Indeed going on this report in the Herald it looks as though a Samoan language version of this publication was outlawed by the administration. According to Allan Kirk in Samoa’s fight for freedom the Samoa Guardian was set up by three prominent residents of Western Samoa, as it was known then: Olaf Nelson, Edwin Gurr and George Westbrook. "Knowing the value of information, Nelson, Edwin Gurr – a Western Samoan resident – and George Westbrook – another resident and trader – launched the ‘Samoa Guardian’, an opposition newspaper. It was printed in purple ink to match the colour of the lavalavas worn by members of the Mau. Before long nearly all Western Samoans wore purple lavalavas (p.16)." Ref: Herman John Schmidt, Olaf Frederick Nelson, 1909, Sir George Grey Special Collections, Auckland Libraries, 31-56024. Ref: A.J. 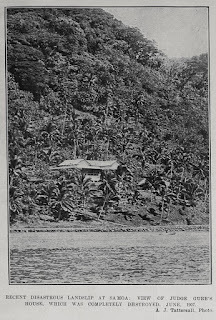 Tattersall for the Auckland Weekly News, Recent disastrous landslip at Samoa, 27 June 1907, Sir George Grey Special Collections, Auckland Libraries, AWNS-19070627-7-7. A note on our record says that articles in the newspaper by “Claymore” have been identified as being by Thomas Benjamin Slipper (1879-1940) who was a solicitor and counsel for the Mau..
Slipper pops up again and again during his time in Samoa defending locals, criticising the administration and working for justice. Slipper seems to have immediately attracted the attention of the officials in Samoa as Field notes here during July 1927, ”Richardson was pressing for urgent deportation of the six white members of the committee, as well as a recently arrived lawyer from Wanganui, Thomas Slipper, who was siding with the Mau (Field, 1991, p.100).” Just a few months later, in September, Slipper is found representing the Mau when the royal commission arrived in Samoa. Chaired by New Zealand Chief Justice Sir Charles Skerret with Native Land Court Judge Charles McCormick, the commission’s terms of reference were reasonably loose. It was to inquire whether there was any “just and reasonable cause” for complaints about the Administration, whether officials had failed or exceeded in their duties and whether it would be “prudent and safe” to abolish banishment (Field, 1991, p.101)." Ref: Auckland Weekly News, Native unrest in Samoa, 15 March 1928, Sir George Grey Special Collections, Auckland Libraries, AWNS-19280315-39-3. On 25 May Stephen Shepherd Allen, the colonial administrator of Samoa, stopped a telegram the lawyer Slipper wanted to send to Nelson in which he said since the visit of Maui Pomare seventy-two people had died on the northern ‘Upolu coast and 1820 people were ill due to influenza. So Slipper had the message sent from Pago Pago. In addition to Slipper posting news to Nelson, who was exiled at this time, “in July the New Zealand Samoa Guardian published the names of 68 people who had died in ‘Upolu since Maui Pomare’s visit. Allen continued to hold that no epidemic existed. The Mau claimed that the death toll eventually reached 1000 (Field, 2006, p.129)." Ref: Auckland Weekly News, Influenza patients from the ship Maui Pomare brought ashore to a temporary hospital in Auckland, 11 April 1929, Sir George Grey Special Collections, Auckland Libraries, AWNS-19290411-47-1. Slipper seems to have again been in the thick of things when the police opened fire on striking Chinese plantation workers. Akui Ah Quoi was blamed by the administration for inciting the labour strike and then deported. Slipper lodged a writ of habeas corpus demanding his release but the court refused to grant it (Field, 2006, p.134). Slipper represented the relatives of the victims of Black Saturday. After that trial when the police were searching villages for other members of the Mau, Molia a sixteen year old boy was shot and fatally wounded by a police officer. At the instigation of Slipper, Luxford took a dying deposition from the boy who described how he was shot whilst unarmed. After this the Women’s Mau hired Slipper to make written representations to Blake and Allen concerning village searches after they had seen Allen personally and failed to get satisfactory assurances on the conduct of the troops. “I am instructed that it appears to the ladies of Samoa that their representations to Your Excellency as to the safety of themselves and their children are regarded as of no consequence." For writing this letter Slipper was prosecuted by Allen for defamatory libel, Luxford found Slipper guilty and sent him to jail for three months and fined him £105. Slipper unsuccessfully appealed and at the end of his prison term was deported from Samoa (Field, 1991, pp.178/9). A decade after being deported from Samoa, the papers in New Zealand reported that Slipper committed suicide by poison in an Auckland boarding house. If anyone can shed further light on the provenance of this typescript please do get in touch, it would much appreciated. With some more digging around there could even be a book here! 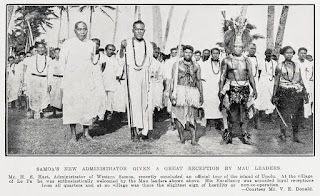 Ref: V. E. Donald for the Auckland Weekly News, Samoa's new administration given a great reception by Mau leaders, 12 August 1931, Sir George Grey Special Collections, Auckland Libraries, AWNS-19310812-44-2. The NZETC has a digitised copy of Samoa under the sailing Gods available, containing an appendix of Slipper being critical of General Richardson. The National Library blogged about the recent digitisation of four of Samoa’s newspapers and their availability on Paperspast which will provide a great resource for people interested in Samoa’s history. You can read our previous blog posts on Heritage et AL about Samoa and have a look at our Samoa Historypin collection. I'm not surprised Rev. A.B. Chappell had copies made of the NZ Samoa Guardian. He was the Government's fiercest supporter in the fight against Nelson and the Mau, and wrote tirelessly in the press in favour of the Government's policy. See A.B. 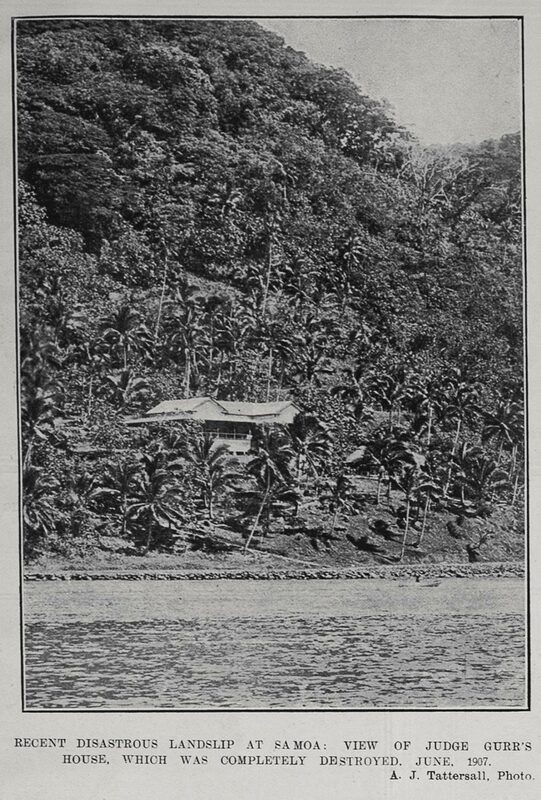 Chappell, The Stir in Samoa: An Independent Review (1928).